This tour takes place at Marino Ballena National Park from Piñuela Beach to Ventanas Beach. There are more than 20 caves along shore where the mountain is dramatically ending on the ocean. Some of these caves are able to paddle inside out depending on the tides and ocean conditions. There are chances to see dolphins and turtles during the first paddling to Hermosa Beach. 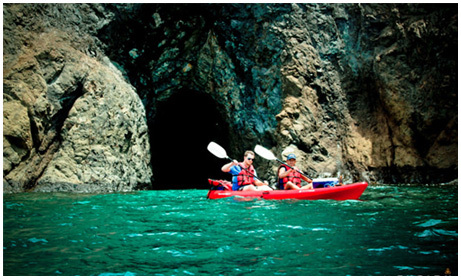 Once there you will have the chance to surf waves with kayaks, take a break and enjoy of two spectacular caves located at the beach. Mangrove Swamps are one of the richest natural environments in the world. This special habit has the Mangrove trees, the only plant that thrives in salt water. You will have chances to see a great variety of birds in the swamps including: Bare-Throated Tiger Heron, Little Blue Heron, Three and Two-Toes Sloth, Northern and Crab Eating Raccoons, and White Nosed Coatis. Some of the most commons reptiles in the swamp are the Green Iguana, Jesus Christ Lizard, Boa Constrictor snakes and six different species of crabs. The tour takes place at Hatillo Mangrove Swamp located 7 km north from Dominical. The tour schedule depends on the ocean high tides when the kayaks are able to go into the Mangroves Swamps full of water. Therefore, some days are not possible to be operated.